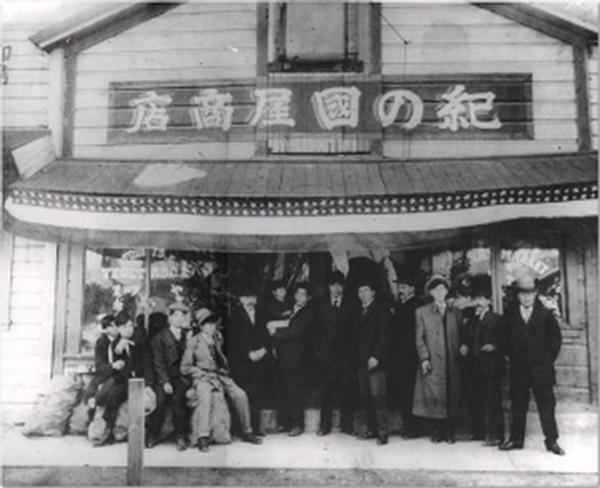 The Japanese pioneers of San Jose were called the Issei (first generation). These immigrants were seeking an escape from their economic burdens in Japan. The agricultural industry drew them to the Santa Clara Valley in the late 1880's. As anti-Chinese exclusionary laws took their toll on the local Chinese population, white growers started to favor Japanese labor over the aging and numerically declining Chinese labor pool. San Jose's Japantown (also known as "Nihonmachi") began in 1900 as the Valley's Japanese farming community became established. It was formed next to Heinlenville, a Chinatown that was created after the previous downtown Chinatown was a victim of arson. At one time, Heinlenville was enclosed by a high wooden fence topped with barbed wire to protect the residents and businesses from anti-Chinese elements. Nihonmachi was a comfortable place for the Issei to gather together to survive in a society hostile to their presence. It was a place to find not only Japanese foods and products, but also boarding houses, employment agencies, social clubs, bath houses, merchandise stores, and restaurants. According to the 1910 census, 85 percent of the Japanese immigrants to California were male. During this early “Bachelor Society” period, Nihonmachi catered to a young male, migratory population. Gambling houses, saloons, and brothels were some of the businesses that attracted that demographic. The Issei soon faced similar nativist outrage that the Chinese encountered. With the Gentleman’s Agreement of 1907, Japanese male immigration was halted, but Japanese wives of U.S Japanese residents were allowed to immigrate. The "picture bride" system was established so that Japanese men living in the United States could marry a women in Japan by proxy and bring their new wives to America. Photographs were exchanged to enable this arrangement. The arrival of Japanese women made it possible to establish permanent communities. The exhibit provides a sense of the adjustments the Issei made in their new country and the institutions and businesses that were important to Japanese pioneers. San Jose Japantown is one of only three surviving Japantowns in the United States.JAMsj offers historical walking tours through Japantown. For more information, visit the San Jose Japantown Walking Tours web page. Picture brides arrive in America and wait to meet their new husbands.